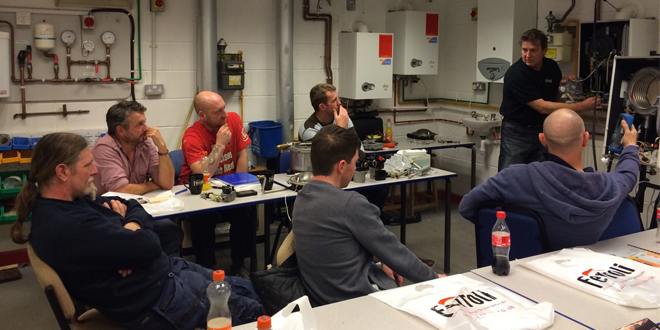 Further education college, Coleg y Cymoedd – meaning college of the valleys – is now THE place to go in South Wales for full training on the Ferroli Modena HE range of domestic boilers. At the Ystrad Mynach campus in Caerphilly, Level 4 gas engineers can learn how to install and maintain the Modena boiler on fully working 27kW & 32kW combi and 18kW system models. Lea Thomas, Coleg y Cymoedd’s Gas Centre Manager & Assessor, wanted to extend the scope of the college’s gas training courses by having the most modern and user-friendly appliances on-site that would give students skills that could be immediately put into practice in the workplace. “A colleague recommended Ferroli as a partner for our gas assessment courses after hearing about the excellent performance of the new Modena boilers. I contacted AJ Kalirai, the Ferroli ASM for our area, and within just two weeks the training room was set up and fully functioning, ready for the start of the 2014 autumn term. At Coleg y Cymoedd’s Ystrad Mynach campus, professional gas engineers can renew their Gas Safe registration. Level 1, 2 & 3 Plumbing qualifications are also available at the Aberdare, Nantgarw and Ystrad Mynach campuses. Contact training@ferroli.co.uk for dates of the next courses or visit www.cymoedd.ac.uk / email lea.thomas@cymoedd.ac.uk for more information.